The creation of good case studies to support work in progress and to give answers to those seeking guidance in their quest to come to terms with perennial questions is no easy task. 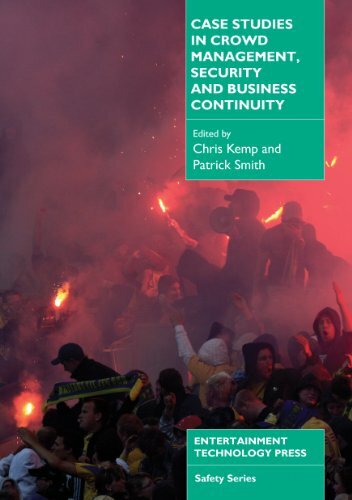 The first Case Studies in Crowd Management book focused mainly on a series of festivals and events that had a number of issues which required solving. This book focuses on a series of events that had major issues that impacted on the every day delivery of the events researched. Chris Kemp has been active in the live music industry for the last two decades. He has worked as a promoter and venue manager creating the PITZ Club and Clock Inn for Comedy in Milton Keynes where he promoted over 3000 acts including Iron Maiden, The Passadenas, Blur and the Stranglers, during a twelve year period. He is now Professor and Pro-Vice Chancellor at Buckinghamshire New University where he created the first ever undergraduate degree programmes in music management, crowd management and protective security. Chris now works through the International Centre for Crowd Management and Security Studies across the world, joining with industrial partners to make events safer globally. Patrick Smith s professional life has been spent teaching and facilitating learning and development in a range of settings, both formal and informal in schools, colleges and universities in the UK and abroad. In recent years his interests have centred on aspects of work-based learning and development within Buckinghamshire New University. He maintains a productive career as a writer on aspects of learning, teaching and development and runs a Masters Degree in leadership and Management.